Sixty great word and number puzzles for the autumn term! 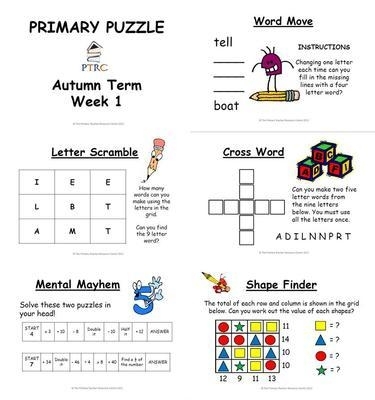 Primary Puzzle - Autumn Term Pack. 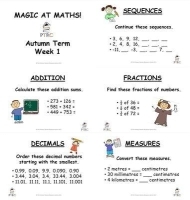 With this termly pack you will receive 12 weeks of puzzles. Each week there are 5 puzzles and all the puzzles will be emailed to you within 24 hours of purchase. Primary Puzzle is a set of five puzzles to be completed over the period of a week (one each day) Each puzzle is planned to last approximately 10-15 minutes and is ideal to be completed first thing in the morning or straight after lunch - in fact whenever you get a spare couple of minutes! Word Scramble - How many words can be made from 9 letters. Shape Finder - Find out the value of each shape in the grid. Cross Word - Make two five letter words from the letters given. Word Move - Changing one letter each time can you may the target four letter word? This resource can be either sent electronically via email (FREE) or can be sent via first class mail loaded onto a CD (P&P £1.00). Please choose your preferred method at the checkout. Due to the size of the pack this resource is not available through instant download and instant will be emailed within 24 hours.